Looking west along the Albany-Corvallis Highway from Scenic Drive. Roughly 10,000 drivers a day drive Highway 20 between Albany and Corvallis and back again, and most of them could recite all its hazards. But the state is sponsoring a safety study anyway. The question is whether anything will be done when this study is complete. In 2012, ODOT commissioned a “road safety audit” on Highway 20 at Granger Road and Independence Highway. The audit recommended certain steps to make the intersections less risky, but nothing was done. Now we have a study, by ODOT and DKS Associates of Salem, of the entire 8.4 miles from Spring Hill Drive in North Albany to the city limits of Corvallis. On Wednesday, March 2, the study team will hold a public gathering to explain the process and answer questions. It’s from 4 to 6 p.m. in the “Old School” of the Children’s Farm Home in Corvallis. The study team has posted information online at www.us20safetystudy.com, and it has a lot of data about daily traffic volumes, trouble spots and a crash history from 2010 through 2014. It also has a page for readers to click on a map of the highway and add their comments about that particular spot. 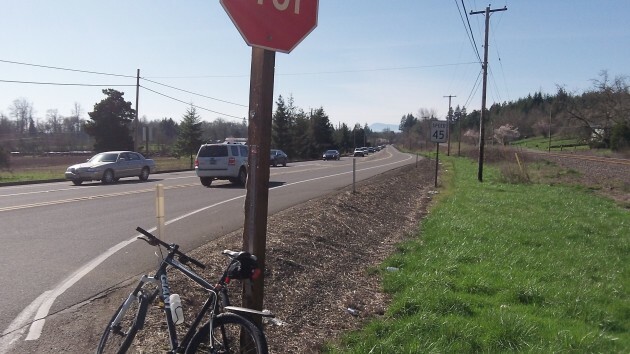 Some of the commenters complain of the danger of rear-end accidents at Scenic Drive and other spots, including Garland’s Nursery closer to Corvallis. Indeed, according one of the slides on the site, the highway has had 55 to 70 crashes per year during the five-year study period, 30-40 involving injuries. Rear-end and turning crashes predominate. There have also been three deaths. Traffic volume — the total in both directions — in the segment between Granger and Independence is about 19,400 a day. Between 7 and 8 a.m., about twice as many drivers head toward Corvallis as go toward Albany. Between 5 and 6 p.m., the proportions are reversed. On a bike ride Monday, I took the highway from Scenic back into Albany. The shoulder is wide enough for this, though part of the way I was riding in what seemed like a narrow slot between the guard rail a foot or so on my right and passing traffic about a couple of feet on my left. The city of Albany has plans for a bike path far away from the highway along that segment, and it would be nice to have. As Mr. Collins points out below, the story had an error, which has now been fixed. Hasso: when you rode on Monday, did you mean Senic to Albany? Springhill to Albany would be a very short trip. Hasso, you are kidding yourself if you think ODOT is going to improve Hwy 20. I moved to Corvallis in 1949 and with the exception of the new bridge in N. Albany, the 4 lanes plus the lights, the removal of a curve past Hyatt Park and a light at Circle, it is virtually unchanged in 67 years. With all the ODOT budget going to feed the bureaucracy, there is no money for road improvements.